It’s all four of us walking, the last walk of the year, and we’re going on the Wroxton Loop, which the children and I love, and which Stevie’s never done. 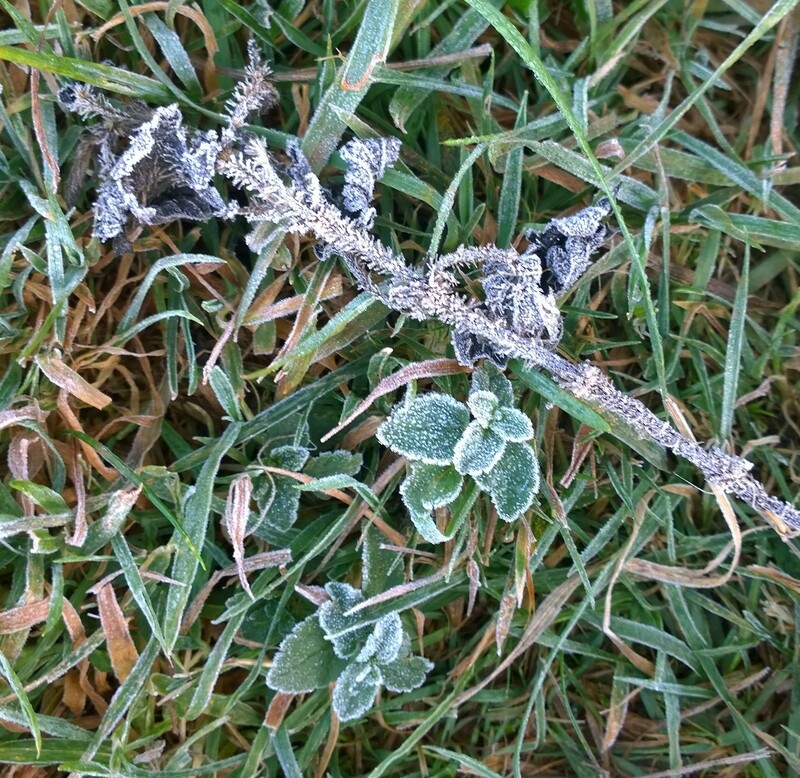 It’s past eleven when we leave Horley, and the ground is still held tight by frost. Our breath plumes fleeting clouds in the windless air and our wellies slip on the frozen tarmac of the Wroxton Road. The dogs know we’re off on adventure and pull at their leads, towing the children up onto the crisped verges and down again; Pants high-stepping in excitement. At the bottom of our village, we go left, across Emma’s Meadow, then right, across the new wheat field and towards the old rail track. The sun has melted the frost on the path and our feet squelch through rich, red mud. The acid-green and yellow crab apples that had been trapped, floating, in Martin’s new ditch, have all sunk, and turned silty grey. The old railway is a busy walk, rutted and water-filled, thick with the fallen leaves of hawthorn, ash. The mud is crowded with footsteps, paw-prints and the tracks of bikes; all of the ice has been smashed and lies in shards over the path. The dogs run off ahead, hysterically intent, white-eyed, and the children follow, fitting their boots into the hoof-pocks of local ponies, momentarily morphed to unicorns. Stevie and I watch them gallop off and he catches my hand. The children pull Stephen past the Glebe House and to the footpath that curves back to Wroxton. We’re ankle-deep in Herb Robert and baby nettles; lush-leaved despite the cold. The path passes by Drayton’s tiny church, St Peter’s, tucked into its cushion of meadow. It’s too low for the sun to see and remains frosted, as if popped into the deep-freeze to wait for summer. We’re on our favourite stretch of the walk now, into the folds and creases of field and wood, Oxfordshire rolling on before us, ancient and benevolent; living to a beat of its own. The bridge is a low stone-built cattle-bridge over the Sor Brook, and we stop there to eat our picnic of turkey-stuffing rolls with pickle, and a box of grapes. The children dare each other deeper and deeper in the stream, and Pants splashes past, thrilled with his own fractured reflection. There are long gouges in the wheat-field here, made from tractor-wheels, and finally Jess can stamp some unbroken ice. She does some slowly, some furiously, finally just jumping up and down, cracking, mashing. Pants barks encouragement. ‘I won’t,’ she says, scornful. Finally, we persuade the children onwards, up the Hill of Doom to the needle. It’s an obelisk, put there to commemorate the visit of the Prince of Wales in 1739. There are people circled around it, taking photographs, and we catch the dogs, wave and walk on. The children, already grumpy at leaving the bridge and climbing the hill, start to revolt in earnest, and Elle tries to do a death-walk on a wall around a pond. Jess and I run away, hating it when Stevie and Elle lock horns. They finally trudge up the last hill to catch us; Elle sullen, Stevie impatient, stalking in his boots. We walk on in silence, past the Dovecote and down into Wroxton. Somehow, the bad moods pass without comment, and our family equilibrium is restored as we pass the poor, empty North Arms. ‘Let’s buy it and live there,’ says Elle. We shake our heads. ‘It’s thatch,’ says Jess, as if that settles things. We cross the main road onto the Horley Road, and Stevie walks slowly past the sport’s field. ‘What’re you doing?’ I ask. I suddenly remember we’re now nearer to Midsummer’s Eve than away from it. The time’s gone so fast. ‘Last family walk of 2014,’ I say. The children are ahead with the dogs, racing each other, hooting. Loud and bright and now almost as tall as me. Now getting into the New Years Eve Spirit with our own resident blogger Mrs Lee. I’m just of for a walk on this fine frosty sunny morning and will take some photo’s of our fab Horley “views” to include on our site. If you have any you would like to share please email them to me horleyviews@outlook.com and we can all enjoy them………….. I walked this with you – with memories of taking a short cut from the Art School in Banbury up to the Needle and through the grounds of the Abbey. I lived in Wroxton for a short while and worked at the North Arms way long ago when the world was young. The North Arms is empty? Empty? Sad days. It’s pretty good where we are now, on a low mountain in mid Wales – but those Wroxton days were magic. Hello Felicity! How lovely to hear from an old Wroxtonian. Poor old North Arms, honestly, it’s heart-breaking to see. Hope you’ve a lovely pub on your mountain – whereabouts are you?